Chevrolet Cruze hatchback: More raked and swept back than the hatchback version of the smaller Chevy Sonic. 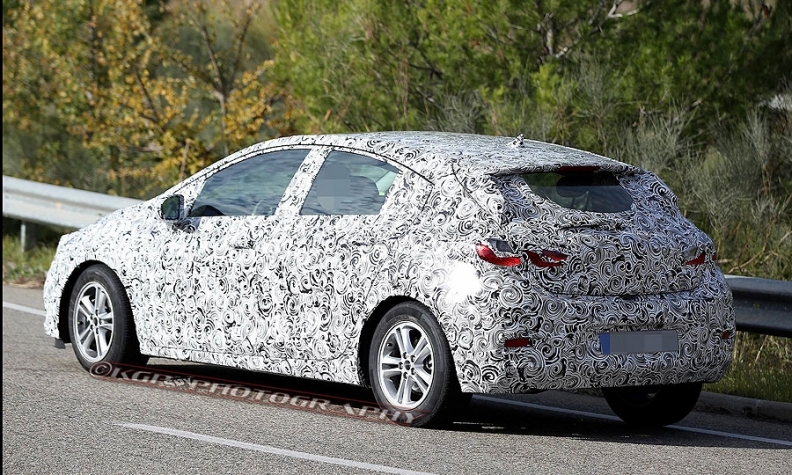 DETROIT -- Recent spy photos add to the mounting evidence that Chevrolet is prepping a U.S. launch of a Cruze hatchback to take on the Ford Focus in the modest market for five-door compacts. The photos show a disguised Cruze hatch that features a front end nearly identical to that of the sedan, including streamlined headlights and a deeper, wider take on the traditional twin-port grille. The car’s profile is more raked and swept back than the hatchback version of the smaller Chevy Sonic, for example, which is relatively upright and boxy compared with the future Cruze five-door, the photos show. Chevy is expected to unveil the Cruze hatchback next month at the Detroit auto show. The on-sale date is likely late 2016 or early 2017. Powertrain possibilities include the same 1.4-liter turbocharged engine that will be the sedan’s base powerplant, and a 1.6-liter diesel that Chevy has confirmed will be coming to the lineup in 2017. Officially, GM says it has not confirmed plans for U.S. sales of the hatchback. But Chevy executives showed U.S. dealers a hatch variant at a national meeting in June. In September, GM’s CFO for North America, John Stapleton, told investors during a conference that Chevy has “a new hatch coming on the Cruze,” according to a transcript from the event. Since 2011, GM has sold a hatchback version of the current Cruze overseas, including in China and Australia. GM global product chief Mark Reuss has said that not bringing the hatch stateside was a mistake. Hatchbacks typically account for around 40 percent of Focus sales, Ford chief U.S. sales analyst, Erich Merkle, told Automotive News in June. The Cruze hatchback also would compete against the Volkswagen Golf, Mazda3, Hyundai Elantra GT and a Honda Civic hatchback that is expected to go on sale next year. GM and other automakers see untapped demand for five-door cars among U.S. buyers, who historically have been cool to the body style. IHS Automotive expects hatchbacks to grow to 7.8 percent of U.S. light-vehicle sales by 2020, up from an estimated 5.3 percent this year.